Paradigm Fresh offers a fresh approach to produce packing and distribution. From fresh produce to our fresh ideas about doing business and fresh attitude about taking care of customers, we provide attention to detail in every layer of our operation to benefit your business. It’s a new paradigm in the produce industry. We brought together our family-owned company in 2014. Owner John Harris grew up on an onion farm and has been involved with onions in some form – growing, packing, shipping, distributing, brokering – since he was a child. John and our team members know produce markets and growing regions. We have long-term relationships with sellers, buyers, and transportation companies. And we embrace technology to improve business practices, leading to better business for our customers. We focus on service from the beginning of a purchase through to the final delivery. We expect your experience with us to be smooth from start to finish. Year-round onion packing and distribution. Top-of-the-line packing equipment for cartons and consumer bags. Fulfillment for all types of retail requests, even on short notice. Delivery capability across most of the U.S. within 72 hours. Service to all regions including import/export to and from Canada and Mexico. PrimusGFS certified with superior rating of 98%. High-volume storage capability for bulk produce. Multi-temperature storage keeps delicate, temperature-sensitive produce fresh. Cross docking for direct transfer between inbound and outbound trucks minimizes storage time and space to save you money. Computerized inventory management provides access to detailed inventory summaries. Custom-tailored retail distribution solutions allow consolidation for your retail customers. Covered, secure docks ensure safe and productive loading and unloading in all weather conditions. Flatbed loading and unloading capabilities. Can repack distressed items for resale. PrimusGFS certified with a superior rating of 98%. 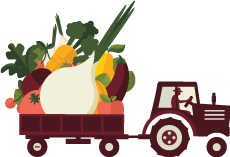 Dependable Carriers – Long-term relationships with dependable, qualified, proven carriers and truck brokers experienced with transporting produce year-round. In-House Reefer Truck Fleet – Paradigm Fresh Logistics refrigerated trucks ensure your perishable produce is properly cared for at all times. Proactive Communication – Ongoing shipment tracking enables us to notify you promptly in case of delay.